The nature of the Lynx game often has us timing outside with computer monitors. Sometimes you will have difficulty seeing the screen due to brightness of environment and sometimes you just need your mouse and can’t find it, especially if you use more than one monitor. 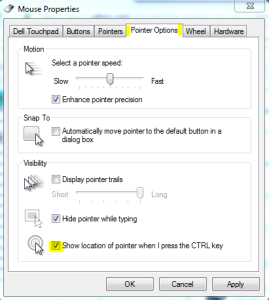 We find that turning on the locate mouse with control key feature under control panel > mouse > pointer options (tab) > check at bottom show location can be helpful. The other thing to know in a pinch is that alt+t will toggle capture on when you are in an event.